You will always be able to find an excuse for why “right now” is not the best time to head back to school to finally earn your degree. As many of our students and alumni will tell you, though, there is never going to be a perfect time to take on this new educational adventure. But they will also tell you, once you start, you find your balance, learn how to make it all work and before you know it you are lifting that diploma in the air in celebration of all your accomplishments. If you are someone who has been delaying your dream, don’t put it off any longer. 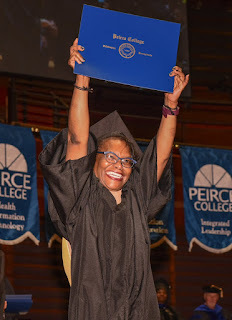 Peirce College is ready to get you across the finish line! The first step? Join us for Peirce Night. Peirce Night is an open house designed to not only launch your educational journey, but to also introduce you to some of the external opportunities you will have available when you join the Peirce community. At this particular event, you will get to take part in a Saving and Budgeting workshop presented by Clarifi for free! This workshop will cover topics such as the bare bones of budgeting, taking control of your budget and financial well-being, money management, family financial education, connecting personal finance goals with current spending and more. As a Peirce student, you will get to not only learn from professors who are experts in their fields, but you’ll have countless workshops available like this one to further develop your professional and personal skills. When you graduate from Peirce College, diploma in hand, you will be ready to take your new skills and knowledge to the workforce and achieve your top career goals. So take the first step and come meet the Admissions Team at Peirce College who are eager to get you started! Join us on Tuesday, March 5, 2019 at 5:00 p.m. on campus at 1420 Pine Street, Philadelphia, PA. RSVP today by visiting peirce.edu/peircenight.